This week will mark two months since Donald Trump, then the president-elect, named Andrew Puzder as his choice to be secretary of labor. In the weeks since, most of the rest of Trump’s first batch of Cabinet nominees have, despite fits and starts and opposition from Democrats, advanced through the Senate confirmation process. Five have won approval, as many as four more could be confirmed this week, and several others should be ready to start their jobs by the middle of the month. Puzder, however, has languished. The fast-food executive, who runs the parent company of Carl’s Jr. and Hardees, has submitted none of the paperwork required by the Senate committee overseeing his confirmation. As a result, the panel’s Republican chairman, Senator Lamar Alexander of Tennessee, has delayed Puzder’s confirmation hearing four times, and now his testimony has been put off indefinitely. An aide to Alexander said the chairman would not schedule Puzder’s hearing until the committee received both a signed agreement from the Office of Government Ethics and responses to a standard questionnaire that is also missing from his file. 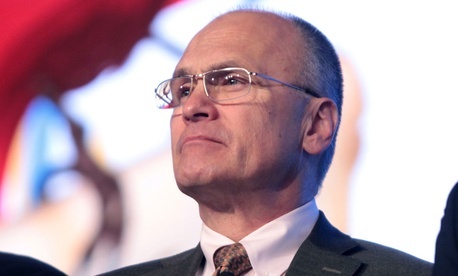 The delays, along with near-silence from his team, have fed all sorts of rumors and speculation about Puzder, who was already facing stiff Democratic opposition because of his past statements about the minimum wage (he’s against it), a history of labor-law violations at his companies, allegations of domestic abuse by his ex-wife in the 1980s, and risqué ads that Carl’s Jr. has run—and which Puzder has staunchly defended—over the years. Is he having second thoughts? Is he resisting demands from government ethics lawyers to completely divest from his business, CKE Restaurants, after resigning as CEO? In response, Puzder has now twice taken the awkward step of issuing public statements confirming that, yes, he still wants the job. “I am fully committed to becoming secretary of labor and I am looking forward to my hearing,” he said in the most recent of his reaffirmations, sent this week through a spokeswoman after Alexander postponed his hearing for the fourth time. To veterans of the appointments process, Puzder’s experience is a case study in why new administrations should vet potential nominees for financial conflicts of interests before naming them to their posts—something the Trump transition did not do in assembling the Cabinet. In Puzder’s case, that would have meant having him fill out financial-disclosure forms and briefing him on what divestment steps he would need to take in advance. As Richard Painter, the former chief ethics lawyer for President George W. Bush, told me last month, it is common for wealthy candidates to withdraw from consideration once they find out how time-consuming and costly it will be for them to untangle their financial conflicts. That’s exactly what happened to Trump’s nominee for Army secretary, the billionaire investor Vincent Viola, who on Friday backed out of the job after reportedly concluding it would be too difficult to separate himself from his businesses. Nominees in the past have had to give up millions in future earnings from stock options they hold in their companies. “It’s a rare person who has full appreciation of what's involved in going through this process,” said Max Stier, the president of the Partnership for Public Service, a nonprofit organization that has advised presidential transition teams, including Trump’s. “It’s protection both for the administration as well as the nominee or potential nominee to be able to have that private preview. “That would have the better approach,” Stier added. While the lack of early vetting has delayed the confirmation of Trump’s Cabinet picks, it has yet to derail any of their nominations in the Senate. Republicans have largely stood behind the new president, and Democrats have less power to block any of the candidates because of a rules change they engineered in 2013 lowering the effective threshold for confirmation from 60 votes to 51. Still, as the White House has discovered in watching the experience of Betsy DeVos, its nominee for education secretary, the GOP’s 52-48 majority in the Senate is slim. Two Republicans are opposing her, and DeVos will need the tie-breaking vote of Vice President Mike Pence to win confirmation. The fight over Puzder’s nomination is sure to be just as fierce. A group opposing Puzder has filed a motion in federal court in St. Louis to get a judge to unseal his divorce records, which it believes will contain details of domestic abuse that were alleged, and since recanted, by his ex-wife. Puzder likely will have to address all of those issues at his hearing—if he ever gets to one. Alexander came under intense criticism for Democrats for breaking with recent precedent by holding a hearing for DeVos before she had submitted a signed ethics agreement. He has decided not to do the same for Puzder, wanting to avoid a repeat of DeVos’s experience, in which Democrats spent much of the hearing accusing Republicans of trying to jam her through the Senate without sufficient scrutiny. So as he wrangles with the ethics office, Puzder remains stuck in Senate limbo, and Trump is stuck without a labor secretary for the foreseeable future.